The two archbishops of Armagh are leading a “Pilgrimage of Hope” to the First World War graves and memorials of Belgium and northern France at the end of this month. The trip is being supported by Armagh City, Banbridge and Craigavon Borough Council, so that a cross-community group of 16 young adults can travel on the journey led by Archbishop Richard Clarke and Archbishop Eamon Martin. It is hoped that the pilgrimage will help forge new friendships and give the young people an opportunity to explore their cultural identities. The pilgrimage will be centred on Messines, in the Belgian province of West Flanders, where two important battles were fought in 1914 and in 1917. In the Second Battle of Messines, soldiers from the 16th (Irish), 10th (Irish) and 36th (Ulster) Divisions fought and died in grim conditions – after three years of war, local drainage systems had been completely destroyed and opposing forces literally did battle in a sea of mud. Today, close to Messines Ridge, is the Island of Ireland Peace Park, where a replica of a round tower commemorates the thousands of Irishmen who died in the surrounding countryside. The pilgrimage will visit the peace park, which was officially opened by the President of Ireland Mary McAleese, Queen Elizabeth of the United Kingdom and King Albert of the Belgians in 1999. The group will also visit the Menin Gate at Ypres, also in West Flanders, where the Last Post is played by a bugler every night at 8 p.m. There the pilgrims will lay a peace wreath. They will also visit the Ulster Tower at Thiepval, which is Northern Ireland’s national war memorial, and which especially commemorates those of the 36th (Ulster) division who lost their lives on 1 July 1916, the first day of the Battle of the Somme. 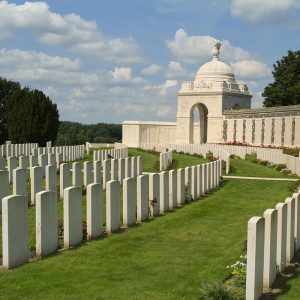 The pilgrims will pay their respects to the fallen at war cemeteries at Thiepval Wood, Guillemont, Paschendale and Tyne Cot. The group sets off from Dublin to Belgium on Wednesday 30 May and is due to return to Dublin on Friday 1 June.